The rise to prominence of ancient Rome is difficult to comprehend in the mainstream narrative. Firstly, within the context of the Mediterranean basin, Rome doesn’t seem strategically important. Secondly, Rome wasn’t well endowed with precious metals i.e. gold and silver. Thirdly, the evidence suggests Rome wasn’t even the centre of the Latin language universe. The Nile data suggests the Mediterranean sea level started to drop somewhere around 300 CE. 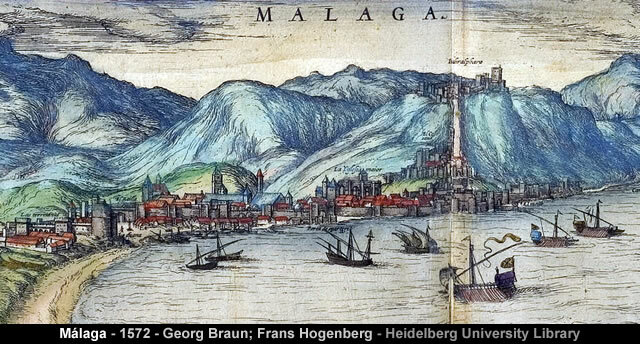 The drop in the Mediterranean sea level left many old natural harbours high and dry. However, estuary ports [with gentle continental shelf gradients] remained operational. Ostia Antica is a large archaeological site, close to the modern town of Ostia, that is the location of the harbour city of ancient Rome, 15 miles (25 kilometres) southwest of Rome. “Ostia” (plur. of “ostium”) is a derivation of “os”, the Latin word for “mouth”. At the mouth of the River Tiber, Ostia was Rome’s seaport, but due to silting the site now lies 3 kilometres (2 miles) from the sea. 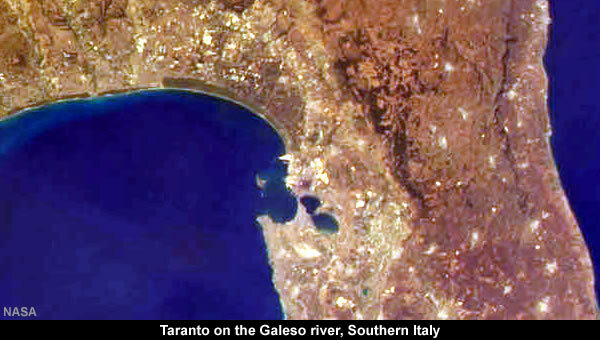 Taranto‘s pre-history dates back to 706 BC when it was founded as a Greek colony, established by the Spartans. The ancient city was situated on a peninsula; the modern city has been built over the ancient Greek city of which only a few ruins remain, including part of the city wall, two temple columns dating to the 6th century BC, and tombs. The islets of S. Pietro and S. Paolo (St. Peter and St. Paul), collectively known as Cheradi Islands, protect the bay, called Mar Grande (Big Sea), where the commercial port is located. Another bay, called Mar Piccolo (Little Sea), is formed by the peninsula of the old city, and has flourishing fishing. The Little Sea is considered to be a lagoon… The Galeso river flows into the first half. When the level dropped by about 400 metres the Mediterranean split into two separate sea basins. The Strait of Messina, is a narrow strait between the eastern tip of Sicily (Punta del Faro) and the western tip of Calabria (Punta Pezzo) in the south of Italy. The strait’s maximum depth is about 250 m (820 ft). The drop in sea level transformed the provincial ports of Ostia and Tarento into strategically vital ports – connected by the Appian Way – that facilitated trade and travel between the Western and Eastern Mediterranean basins. The Appian Way (Latin and Italian: Via Appia) is one of the earliest and strategically most important Roman roads of the ancient republic. The new strategic importance of Rome is underlined by the overland extension of the Appian Way – known as the Via Egnatia – that stretches all the way to Byzantium. Topography and sea level determined why so many roads lead to Rome. 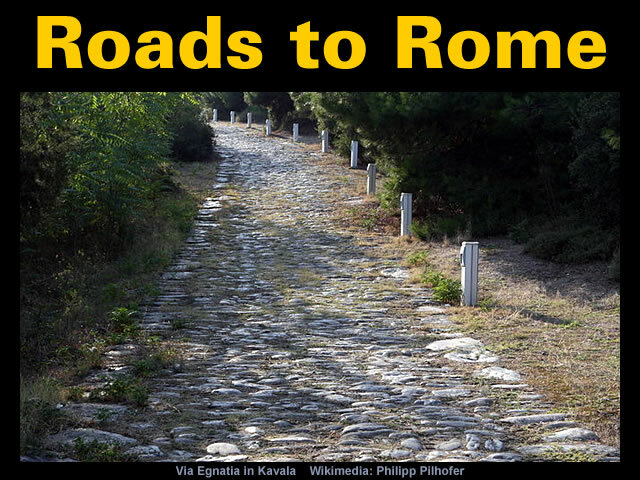 The Via Egnatia was a road constructed by the Romans in the 2nd century BC. It crossed Illyricum, Macedonia, and Thrace, running through territory that is now part of modern Albania, Macedonia, Greece, and European Turkey as a continuation of Via Appia. Starting at Dyrrachium (now Durrës) on the Adriatic Sea, the road followed a difficult route along the river Genusus (Shkumbin), over the Candaviae (Jablanica) mountains and thence to the highlands around Lake Ohrid. It then turned south, following several high mountain passes to reach the northern coastline of the Aegean Sea at Thessalonica. From there it ran through Thrace to the city of Byzantium (later Constantinople, now Istanbul). It covered a total distance of about 1,120 km (696 miles / 746 Roman miles). Like other major Roman roads, it was about six metres (19.6 ft) wide, paved with large polygonal stone slabs or covered with a hard layer of sand. In geology this drop in sea level is known as the Messinian Salinity Crisis. However, the evidence suggests Rome and the Roman Republic were dead and buried by 650 CE. Which means the Roman Empire [just like the Lord of the Rings] is creative fiction. However, if you like your history with a Roman Empire then you’re welcome to keep it. Gallery | This entry was posted in Arabian Horizon, Catastrophism, Geology, History, Old Japanese Cedar Tree, Roman Chronology. Bookmark the permalink. 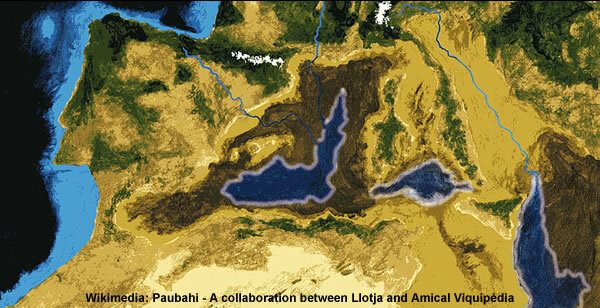 The Messinian Salinity crisis was interpreted by the mainstream academia because of the thick beds or strata of salt in the existing basins. The only way such deposits could be formed was by evaporation of salty ocean water. However it is also possible that the Mediterranean sea never existed in Roman times, and was excavated by plasma erosion associated with the Roman Terminus, with the salty material possibly being as volcanic effluent, since we know of the presence of salt-domes deep in the crusts. Perhaps there were salt domes under the ancient Roman land surface? When the erosional dissipated a deluge occurred, partly from endogenous sources, partly from exogenous sources such as Saturn and filled the newly formed depressions as the new Mediterranean Sea etc, This erosional/depositional event also formed the Sahara Desert and basically cooked the region leading to the holocaust and deluge narratives. But modern academia assume the oceans and seas were present from the beginning, and hence are forced to come with rather limited explanations for observations. The whole historical narrative seems to have been fabricated by the traumatised survivors who only started documenting the impenetrable past during the Medieval period when the strongest organised bandits and gangs staked their land claims from the benighted survivors. There’s one other factor that needs to be understood. People who are from childhood educated or inculcated with religious concepts are trained to blindly accept authority, and academia decorates this subservience with rhetoric. The religious also have another characteristic – enslavement to the past which they can’t forget, and which they often extrapolate to the present or future as prophesy. But then one needs to understand how humans think. Because it’s this activity that produced written history. Is it not possible there could have been a “Roman” Empire, that was subsequently destroyed. Only “Rome” (or whatever the Capital was actually called) was not the city by that name in Italy today? Nice one,Tim. Couldn’t agree more.. I think the Romans were literally Roaming Traders whose skilful navigation let them travelled the seas and set up trading posts all over Europe, spreading their culture while building relationships with their customers, based on providing mutual benefit. Probably a development of the Phoenician trading model of well organised itinerant traders, Latin, of course. being their trading language. The mainstream just don’t have a clue about what happened in ancient times.